All for the Love of Music is the journey through John Schroeder's life – after having completed National Service to landing his dream job with E.M.I Records. John's discovery of Helen Shapiro, and later penning her number 1 hit Walking Back to Happiness made John a household name. During his time in the music industry, John worked with world renowned artists and musicians including Status Quo, Geno Washington and Sounds Orchestral. John details his rich experiences of what it was like to produce award-winning songs, as well as the treacherous path of founding a record label. All for the Love of Music relives the joys and successes, pitfalls and failures throughout John's career, which spans over 50 years, as one of the most widely acclaimed and talented record producers in modern music history. Scattered with photographs that beautifully illustrate his successful career, All for the Love of Music regales John's time at the forefront of the music industry. This book will be enjoyed by those with a passion for music and those who wish to know more about the music industry from someone who's experienced it all. "John Schroeder is in many ways the quiet man of British pop music, a production genius who has largely been content to remain in the background, building up an enviable track record while others grab the limelight. The simple truth is that few British record producers can claim such a wide-ranging success as that which this soft-spoken, slightly built man has carved out for himself". 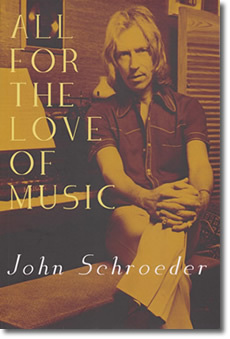 "John Schroeder's account of his career as a producer for EMI and Columbia records is packed with insider information about the record industry and his encounters with legions of popular performers". "A thoroughly good read. If you were involved in the sixties either as a musician or in the music industry this book takes you back with all the excitement and frustrations of trying to make a hit record, finding new singers and of course the roller coaster that is in all our lives as we chase for success and often meet failure and disappointment. I could literally taste the atmosphere in the the Pye studios at Bryanston Street, London".